The Old Almondburians finished the 1949/50 season near the top of the West Riding Old Boys League. 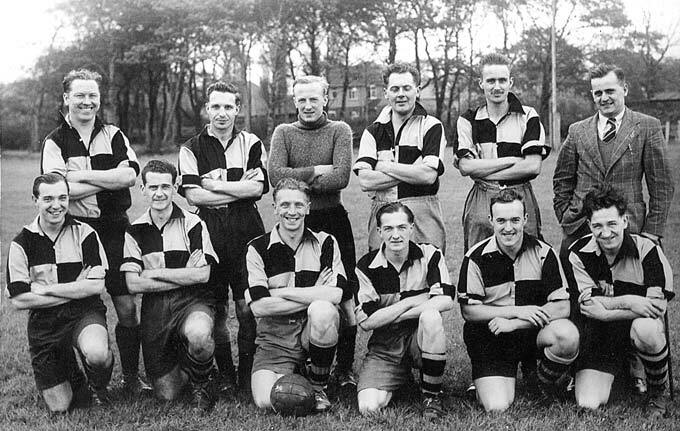 The most memorable game was at Beckett's Park, Leeds against the Teachers Training College; their inside right was Bill Slater, later to play for Wolverhampton Wanderers and for England in 1954. Perhaps not surprisingly, the Old Almondburians lost. (Front row): ? ; George Drummond; Donald Ward; ? ; Ron Edwards; ?. Please click to e-mail the Webmaster if you can identify any of the un-named players.